If 2018 was the year teachers went on strike, 2019 may be the year they pay the price. That’s what union leaders are worried about as lawmakers consider new bills in states where teachers protested. 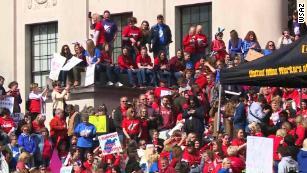 From West Virginia to Arizona, thousands of teachers swarmed state capitols, demanding more school funding or better raises. In some cases, they won. But the wave of protests that’s still spreading like wildfire could get doused by new legislation. In one state, teachers could lose their certifications permanently for walking out. In another, anyone who closes school for a protest could be fined $5,000. 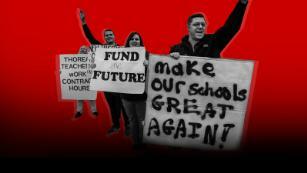 “These cynical bills were written with one goal in mind: to retaliate against educators and the communities who stood up for public education during the walkouts,” said Randi Weingarten, president of the American Federation of Teachers. But Arizona state GOP Rep. Kelly Townsend, who introduced several new bills that would affect teachers, said this isn’t about revenge. What teachers did: This is where it all started. West Virginia teachers had no idea their February 2018 strike would spark a firestorm of teacher walkouts and strikes across the country. With an average salary of $45,642, teachers demanded better pay and improvements to their embattled health care plan. After nine days of the strike, Republican Gov. Jim Justice agreed to a 5% raise for teachers. He also issued an executive order aimed at creating a long-term revenue fix for public employees’ insurance program. What’s happening now: This week, West Virginia senators passed Senate Bill 451, also known as the omnibus education bill. — Withholding teachers’ pay each day they strike if the strike causes a school closure. The bill also forbids teachers from using any of their personal leave days for a strike. — Putting public dollars toward charter or private school education. If the bill passes, West Virginia could get public charter schools for the first time. It would also create an education savings account program, which would allow households making less than $150,000 a year to apply for public funds to help pay for private school tuition, tutoring, online learning programs or other educational costs. Weingarten slammed the bill as “retaliatory,” saying it links teachers’ raises with efforts to make it more difficult to strike. She said the bill doesn’t fix the state’s “chronic underfunding of public education” and promotes privatization instead. But Republican Patricia Rucker, chair of the state Senate’s education committee, said teachers will get their raises no matter what. “First and foremost, the additional 5-percent raise for teachers and school service personnel has been promised and will be delivered, regardless of what we are able to do at this time to reform our state’s education system,” Rucker wrote to CNN. As for public charter schools and education savings accounts, Rucker said both would give families more choices in education. Another co-sponsor of the bill said there’s good reason for combining teachers’ raises with other reforms in the bill. “The bundling of the bill is a strategy to pass more legislation more quickly than allowing the separate components to get bogged down and fail,” Roberts said. SB 451 is now headed to the state’s House of Delegates. So what if it becomes law? Will teachers go on strike again? 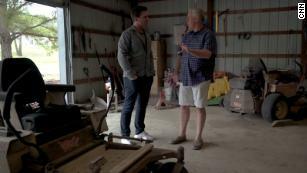 “That is a possibility,” said Fred Albert, president of the AFT’s West Virginia chapter. 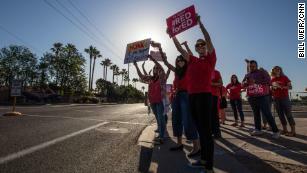 What teachers did: Educators walked out by the thousands last year, demanding a 20% raise for teachers for the 2018-19 school year and annual raises after that until Arizona’s teacher salaries reach the national average. Teachers wanted education funding to be restored to pre-recession 2008 levels and demanded no new tax cuts until per-student spending reached the national average. After six days of protests, Arizona teachers ended their walkout after the governor signed an education funding bill into law. The measure, dubbed the “#20×2020” plan, raised teachers’ pay by 20% over three years. The new law also increased funding for support staff, new textbooks, upgraded technology and infrastructure, which would help make up for recession-era cuts. — HB 2002would prohibit certified public school teachers from “engaging in political, ideological or religious advocacy in their classrooms.” It also says teachers can’t introduce “any controversial issue that is not germane to the topic of the course or academic subject being taught.” Violators could face punishment up to termination. State GOP Rep. Mark Finchem said he wasn’t looking to retaliate against teachers when he wrote HB 2002. Instead, he said, the inspiration came from “parents and teachers of both political stripes” who told him they were fed up with political advocacy in classrooms. “The majority of complaints are about Trump bashing and Trump promotion, as well as the vilification of one political party or the other,” Finchem said. But since the bill would forbid talk of “any controversial issue” not related to the classroom instruction, what should teachers say if students ask them about possible future walkouts? — HB 2016says school district or charter school teachers “may not harass, intimidate or harm any parent, pupil or other public school employee.” Violations could lead to suspension or termination. “Throughout the last year I have received numerous reports from other teachers as well as students who have experienced problems, and this bill is meant to address that,” said Townsend, who introduced the bill. — HB 2017would impose a fine of up to $5,000 for anyone who causes a school to close when students are supposed to be in class. (Exceptions include closures for inclement weather, flooding, wildfires, “an epidemic of disease or plague of insects” and other threats to students’ safety.) 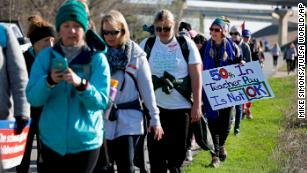 There is no exception for teacher walkouts and protests. — HB 2018 would allow any legislator to prompt the state’s attorney general to investigate alleged wrongdoing by a school district or district employee. Such wrongdoing could include teachers’ strikes, which “are already not lawful,” Townsend said. But she said some teachers found a loophole last year. Townsend wrote the bill after learning about “an organized effort to close the schools” for the walkout, she said. “Teachers called in sick, substitutes were assigned, and then the morning of, they canceled their sick call which canceled the substitute teacher, and then called in sick again just before class, creating a situation where there were not enough adults to safely open the school,” Townsend said. Teachers who did go to school “found the doors locked,” she said. While the bills’ authors say these measures would improve education, the head of the Arizona Education Association said he thinks they’re retaliatory. “It’s truly unfortunate that instead of focusing on Arizona’s teacher vacancy crisis … a few legislators introduced several bills this session aimed at silencing the voice of teachers and other education support professionals,” said AEA President Joe Thomas, a social studies teacher. He said last year’s walkout was successful because it secured more resources for schools. But these bills don’t. What teachers did: Like West Virginia, teachers in Oklahoma ranked in the bottom three states for teachers’ salaries. 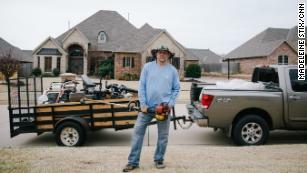 Some Oklahoma teachers worked almost 10 years before cracking the $40,000 mark. But the fight wasn’t just about raises. Oklahoma teachers walked out to demand more school funding, as some high school students read from textbooks as old as they were. Sometimes, 70 students had to share 25 textbooks. Shortly before the walkout, Gov. Mary Fallin approved an average raise of $6,100 for teachers, $1,250 for support staff and a $50 million increase in education funding — fractions of what teachers wanted. 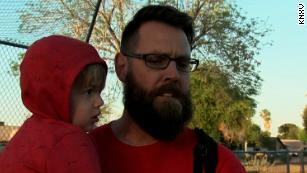 So hundreds of teachers flooded the state capital for nine days. But lawmakers didn’t budge. The walkout ended with no additional funding beyond what the governor approved. What’s happening now: Oklahoma House Bill 2214 would make it illegal for teachers to walk out and protest again. 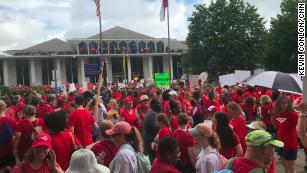 But HB 2214 doesn’t stop there — it would also permanently revoke certifications of teachers who break the rule, preventing them from teaching in the state again. The bill’s author, state GOP Rep. Todd Russ, said the main point is to make sure kids don’t suffer a disruption in their education. “Students deserve to be in their classrooms learning and preparing for their next grade and their next phase of life,” Russ said. He said the new bill fixes a loophole in the existing law. It’s already illegal for teachers to go on strike in Oklahoma. In Oklahoma, a strike happens when teachers protest against a school board while they’re supposed to be in school. But for last year’s “walkout,” many teachers told their administrators they’d be absent. That forced some school districts to cancel classes since there wouldn’t be enough educators in the schools. And because many schools were closed, teachers could protest at the capitol without punishment. Russ said the Oklahoma Education Association skirted the law and he wants to prevent that from happening again. “Much like air traffic control operators and other union groups that are not allowed to strike based on the safety or well-being of third parties, teachers’ unions also understood when House Bill 1017 passed in the 1990s that it would be illegal for them to strike again because of the disruption in classrooms,” he said. But the president of the OEA said she thinks the bill is “retaliation” for last year’s walkout. Alicia Priest said students didn’t miss much education, because some districts added missed days to the end of the school year. She said it was the threat of a walkout that spurred lawmakers to give schools more funding. Posted in Accountability, Advocacy, Arming Teachers, Department of Education, Education Budget, Educators Protest, Evaluations, Every Student Succeeds Act, Failing Schools, Funding For Education, Higher Education, Janus, Mental Health, No Child Left Behind Act, Online Education, Parents, Pension & Salary, Retirees, School Choice, School Closings, School Safety, Special Education, Students and Parents Protest, Teacher Evaluation, Teacher Shortage, Technology in the Classroom, Testing, Vouchers and tagged "Standing Strong for Public Education", #iBelieve, Accountability, Accountability System, Advocacy, Department of Education, Diversity, Education, Education Funding, English Language Learners, Equity, Every Student Succeeds Act (ESSA), Failing, Failing Schools, Federal Education Policy, HBCU, High-Needs Students, NEAExecutiveCommittee, Pension, Pensions, Public Education, School Choice, School Nurses, School Safety, State Budget, Students, Tax, Testing and Accountability. Bookmark the permalink.